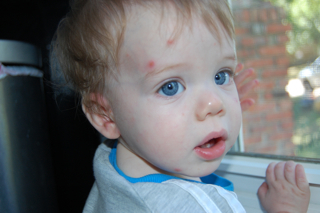 I wanted to share some things about our experience getting the Chicken Pox, just in case it might help someone else out there. BIG disclaimer!!! I am not a medical professional, do not use this to diagnose or treat an illness without talking with a medical professional. That being said, I will share what worked for my family. Honestly, I was pretty excited when I first realized one of the kids had the Pox. I ain’t scared of no Chicken Pox! The first thing I noticed was what looked like a zit on my 4 yr old’s face. I didn’t think much of it until the next morning when she had 5 to 10 more on her chest. Ok! So now what? My first line of defense is always Homeopathy. I’ve used it since I was 8, and I’ve used it successfully with all my children. Notice I said my first line of defense. There have been cases where we either didn’t get to it quick enough or the problem was too severe, and then we had to move on to other options. So, I grabbed my handy dandy Homeopathic reference books and looked up Chicken Pox. I used the remedy recommended and also started “inoculating” the other kids with the remedy hoping that their cases would be milder (which they were). There are some things you should know to properly use Homeopathic remedies. You can’t store them near camphor or anything containing camphor. You also can’t use them while using something containing camphor, it will render the remedy useless. A remedy should be taken under the tongue 15 minutes AFTER eating or drinking and likewise you should not eat or drink for 15 minutes after. If you use mint in the mouth (such as gum or toothpaste) near the time you took the remedy, it will not work. These are just a few points you need to know. There is a degree of skill in evaluating symptoms and choosing the right remedy, a qualified Homeopath or Naturopath is highly recommended. Homeopathy is very safe and has no side effects; however, you must use caution when diagnosing or treating yourself or your family. I have used Homeopaths and Naturopaths many times and they have been amazing at helping me find the right way to heal our kids naturally. It is really worth the investment in my opinion. 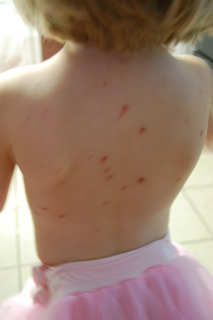 Did you get Chicken Pox when you were a kid? Do you remember your mom putting that pink lotion on your itchy spots? That stuff worked great, but guess what it’s main ingredient is: camphor. So, since that was out of the question, I had to find another option. I took my essential oils, Thieves, Lavender and Pan Away and mixed them together with plain lotion. It worked amazingly well! In fact, the spots started to scab on the second day, which is really fast! I also gave the kids baths in Lavender as often as they wanted. This made me a true believer in essential oils. I knew they were good for you, but I hadn’t experienced the extraordinary healing properties they had until then. The third thing I did was to give my kids lots and lots of ionized alkaline water. This helps the body to detox, hydrates better than plain water and also contains anti-oxidants. It also enhances the ability of the blood to carry oxygen and assists in neutralizing free radicals in the bloodstream. No, not all water is alike. I fed them homemade “raise the dead” chicken stock, and popsicles for their sore throats. All in all, for the Chicken Pox to hit my family of 5 kids, it was extremely mild. My 10 year old felt the worst, but all the kids were on the mend by day 4. Meaning, they were feeling totally well by then and just had the spots left. They “felt” sick for about 24 hrs and all had mild fevers. I’m so thankful for herbs, and remedies that God provided to help our bodies heal! I just thought I’d share our experience. If you want to learn more about using Homeopathic remedies, find a good Homeopath or Naturopath in your area who is well versed in them. It’s great to have an arsenal of home remedies when sickness strikes!